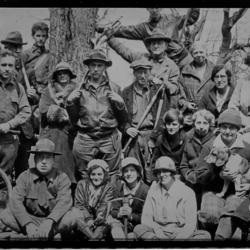 Members of the Roanoke Appalachian Trail Club on Potts Mountain in Central Virginia during the fall of 1939. 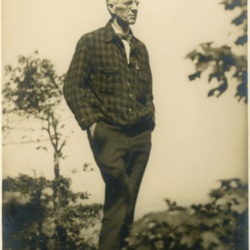 Day hikes like this one were a central activity of the AT Clubs for many decades. Members of one of the Potomac Appalachian Trail Club (PATC) Shenandoah National Park trail crews creating water diversions on one of the many trails in the Park. 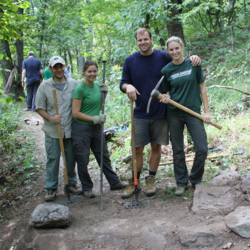 Members of Appalachian Trail maintaining clubs devote hundreds of thousands of volunteer hours each year to the maintenance of the AT and its associated side trails. 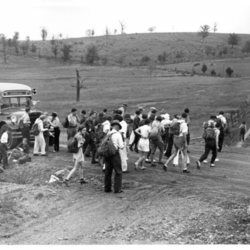 Leaving the bus on a PATC trip to Smoke Hole, West Virginia, April 19, 1936. 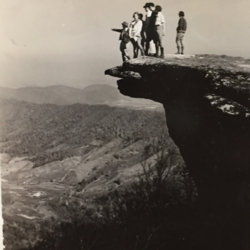 PATC hiking trips during this era were often organized with bus service for members. 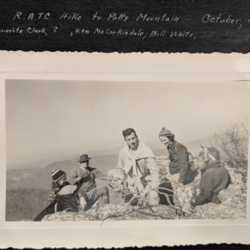 Members of the Potomac Appalachian Trail Club (PATC), Roanoke Appalachian Trail Club (RATC), and the Natural Bridge Appalachian Trail Club (NBATC) on a group hike to McAfee Knob, October 1935. 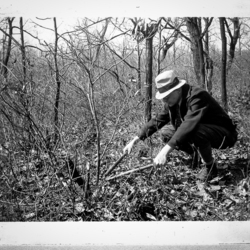 A member of the Philadelphia Trail Club clipping vegetation along the Appalachian Trail, March 23, 1935, on the Little Gap, PA section of the Trail. Club members "cut scrub oak and cleared nearly half a mile through the thickest growth," and later, "paint[ed] blazes all the way through to meet the blazes in from Smith Gap," according to a report of the trail work weekend. This work weekend was one of many that the Philadelphia Trail Club utilized to build their short section of the Trail in 1935.